In 4-quart Dutch oven, cook beef over medium heat until brown on all sides. Reduce heat to low. Sprinkle beef with salt and pepper. Spread horseradish over all sides of beef. Add 1 cup water to Dutch oven. Heat to boiling; reduce heat. Cover and simmer 2 hours 30 minutes. Add potatoes, carrots and onions to Dutch oven. Cover and simmer about 1 hour or until beef and vegetables are tender. Remove beef and vegetables to warm platter; keep warm. Skim excess fat from broth in Dutch oven. Add enough water to broth to measure 2 cups. In tightly covered container, shake 1/2 cup cold water and the flour; gradually stir into broth. Heat to boiling, stirring constantly. Boil and stir 1 minute. Serve gravy with beef and vegetables. You can find prepared horseradish in glass jars in the condiment section of your supermarket. Skip the gravy and serve with more horseradish or a fruit chutney. To carve the roast, place on carving board or serving platter so the meat grain runs parallel to carving board. Holding meat in place with meat fork, cut meat across grain into 1/4-inch slices. 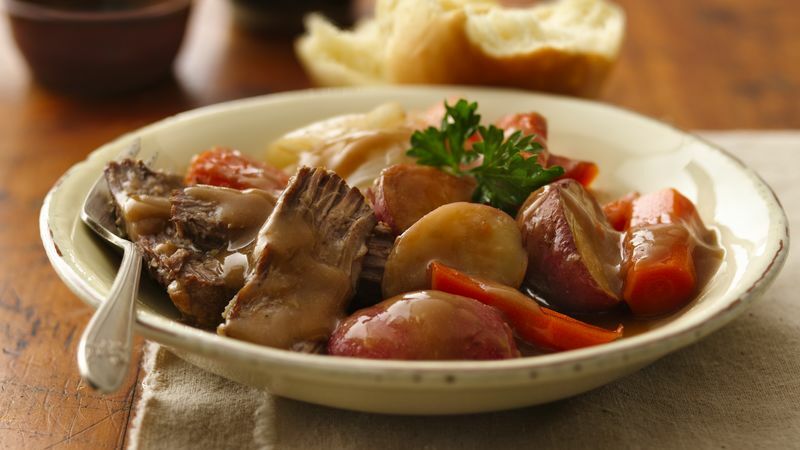 For Cream Gravy Pot Roast, substitute 1 can (10.5 ounces) condensed beef broth for the 1 cup water. For the gravy in step 4, add enough half-and-half or milk, instead of water, to the broth (from the roast) to measure 2 cups. Substitute 1/2 cup half-and-half or milk for the 1/2 cup cold water. For Garlic-Herb Pot Roast, decrease pepper to 1/2 teaspoon and omit horseradish. After browning beef in step 1, sprinkle with 1 tablespoon chopped fresh or 1 teaspoon dried marjoram leaves, 1 tablespoon chopped fresh or 1 teaspoon dried thyme leaves, 2 teaspoons chopped fresh or 1/2 teaspoon dried oregano leaves and 4 cloves garlic, finely chopped. Substitute 1 can (10.5 ounces) condensed beef broth for the 1 cup water. Slow Cooker Directions: In 12-inch skillet, cook beef over medium heat until brown on all sides. In 4- to 6-quart slow cooker, place potatoes, carrots and onions. Place beef on vegetables. In small bowl, mix horseradish, salt and pepper; spread evenly over beef. Pour water into slow cooker. Cover and cook on Low heat setting 8 to 10 hours.